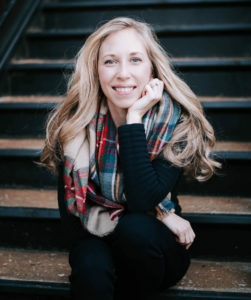 After Wade and I were first married, I was sitting in the stands at one of his ballgames and an adorable family with four red-headed, freckled children caught my eye. I noticed that same family kept cheering primarily for Wade and trying to get his attention. Curiosity got the best of me, so I decided to introduce myself. The excited family was from the Chicago area and had driven hours out of their way to vacation in hopes of meeting Wade. Apparently, their last name is the same as ours, and there aren’t too many out there…especially in professional athletic world. They wanted to know if he or his parents were from Ireland–as they originally were. Ever since, my tall, dark husband and I joke and wonder about his Irish heritage. For us, it’s just one more reason to celebrate Saint Patrick’s Day. 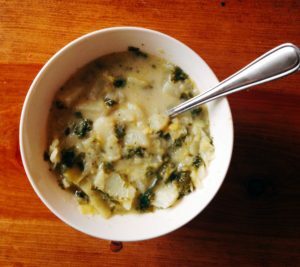 Colcannon is a traditional Irish food, but this startling cold snap calls for soup. Lucky day: here’s a recipe as adapted to my pantry’s contents and my family’s preferences from one of my favorite cooking sites, Simply Recipes. 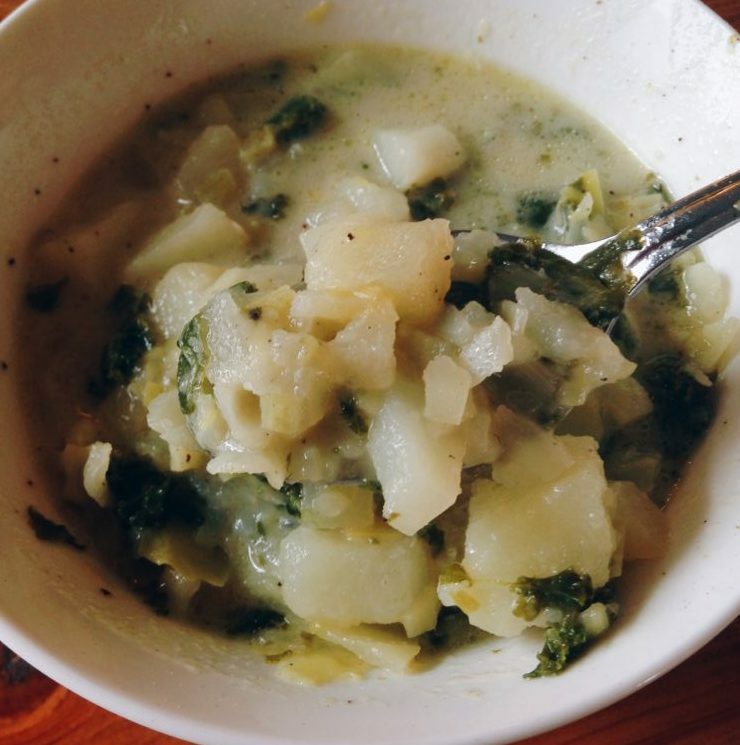 Colcannon soup is a creamy, filling potato soup without cheese…. just the way I like potato soup! 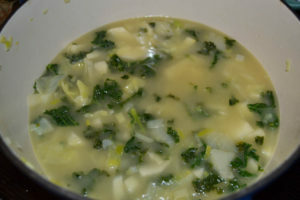 Meatless meal #3: Colcannon Soup. Of course, served best with cornbread. Luck of the Irish to you (though you won’t need it with this recipe)! 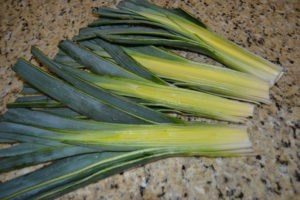 Confession: I have never even purchased leeks until trying this recipe, but I’ve seen them in the grocery store for years. 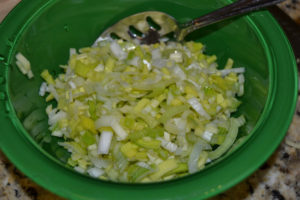 New to leeks too? Here’s how to clean them. Start with a bundle and wash them as well as possible. 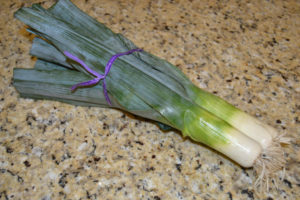 Slice each leek stalk long ways. Chop being mindful that the most tender parts are lighter in color. 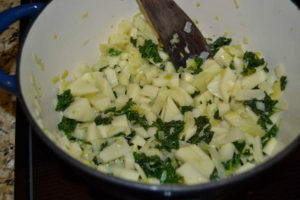 The darker leaves can be cooked as well, but they take a very long time to soften. 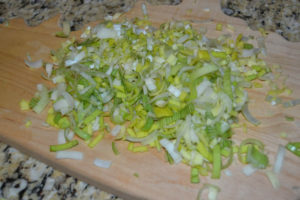 For this recipe, I used primarily the lighter part of the stalk. 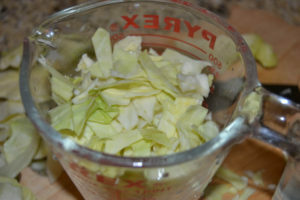 Place chopped leaves in a bowl of cold water and agitate with your hand or utensil. Use a slotted spoon to scoop out the chopped leaks into a clean bowl. Now they’re ready to use! Wash and chop kale (Unsure how to do that? 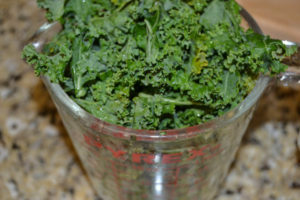 Check out another kale recipe here). The recipe calls for 2 cups of chopped kale. I decided 2 cups of kale is up to interpretation depending if one decides to use 2 cups packed or unpacked kale. I went with 2 cups packed (as in if I pressed down on the fresh kale, it was 2 cups then… hence why the kale is heaping out of the measuring cup). Melt 1 stick of butter in stock pot or large cast-iron dutch oven (my preference). 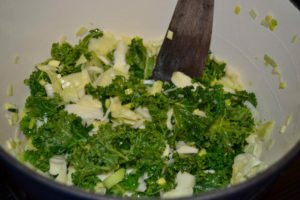 Add seasonings, kale, leeks, and cabbage. 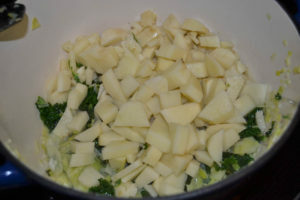 Combine well to coat with butter and place top on pot. Kale will cook down on low heat for approximately 15 minutes. And then add the chicken stock, increasing heat to a slow-simmer. When possible, I try and cook with low-sodium chicken broth. This soup is one of those occasions when the regular broth is a better choice. Remove from heat and swirl in the whipping cream. Start by chopping leaks, kale, cabbage, and potatoes. 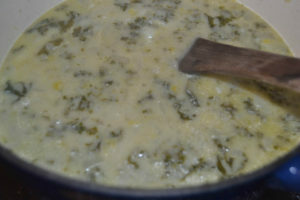 Melt butter in heavy stock pot or enameled cast-iron dutch oven. Add in kale, leaks, and cabbage. 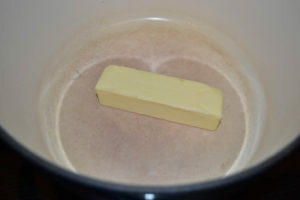 Coat with butter. Return lid to pot, turn heat to low and let kale wilt for approximately 15 minutes. Add in potatoes, chicken broth, salt and pepper. 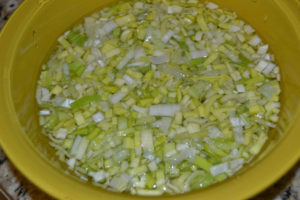 Increase heat to a simmer and cook for approximately 20 minutes. Remove from heat, swirl in whipping cream. Happy St. Patrick’s Day!